Last Friday 16 March 2018 was world sleep day. To celebrate I gave a lecture at Queens University, Belfast for staff, organised by the QUB staff wellbeing department. I was asked to par-take in the lecture was by Dr Gerry Gormley as was Stephen Herron (BABCP Accredited Cognitive Behavioural Psychotherapist Lecturer at Queens and Chair Irish Association for Behavioural & Cognitive Psychotherapies) who also offered his wisdom at the illuminating session. Dr Gerry is a Clinical Senior Lecture at Queen’s School of Medicine, Dentistry and Biomedical Sciences and a GP in Carryduff. 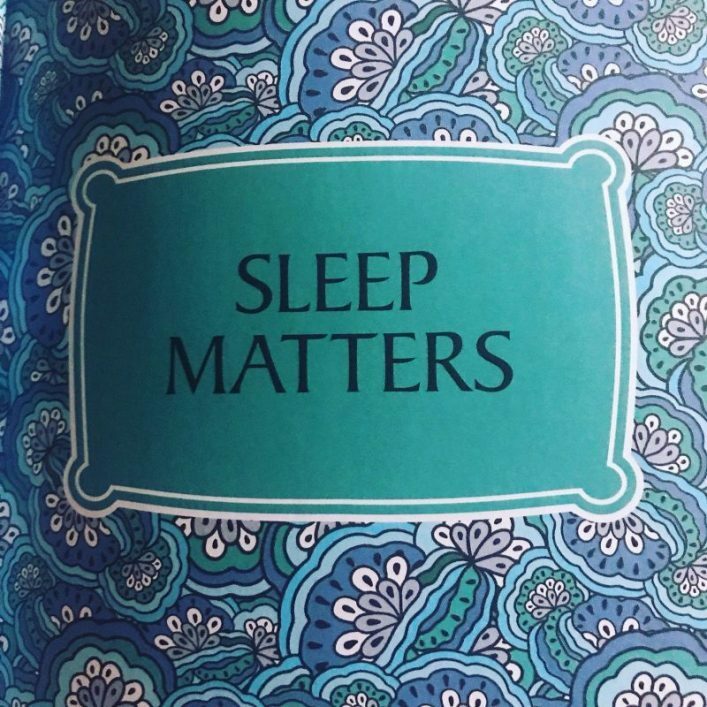 He has a particular interest in sleep and how it impacts our wellbeing. Northern Ireland is the only area of the UK without a regional sleep centre and he would like to change that. Insomnia is as much of a problem here as it is everywhere else in fact the world over lack of sleep is a huge and growing problem. Since the iPhone was launched in 2007 the rates of insomnia have rocketed. Coincidence? I think not – I’m also partial to taking my phone to bed sometimes! If you are in this bad habit consider downloading the ‘moments’ app from the app store. It will tell you just how much time you are using your phone everyday. Probably a lot more than you think – we’ve become addicted to screens and the cost of our sleep. During the information session on Friday Dr Gerry and Stephen gave us many tips on how to improve the amount of sleep we get, after telling us how dangerous it is if we don’t get enough. Lack of sleep is linked with obesity, Alzheimer’s, cardiovascular disease, mental health issues and cancer! I then led the attendees in a mindfulness session, I’ve outlined the details of my session below plus lots of very helpful and mindful tips for better sleep. The number one thing to do is to get the phone out of the bedroom – buy a real alarm clock. The blue light from screens goes to the back of our brain and keeps us awake, you should stop using screens at least an hour before bed. Put the phone on charge in another room. Establish an 8-hour window for sleep and stick to it. The majority of adults need at least 7-8 hours of sleep per night. It’s not possible to catch up at weekends if we don’t get it on the night we lose it – forever! Prioritizing or ring fencing sleep time is crucial. Sleep consistency is crucial too so aim to sleep and wake up at the same time every day – even on weekends. If you’re going to have a lie in do it on a Saturday so you can get back into your normal rhythm by Monday. Spend some time in daylight everyday and get some exercise. Sleep is a fundamental part of our body clock or circadian rhythm (Jeffrey Hall, Michael Rosbash and Michael Young have won the highest accolade in science the 2017 noble prize for their work on this, read more about it here). Our biological clock helps to regulate sleep patterns, feeding behaviour, hormone release and blood pressure. Ensure the room temperature is not too hot, we sleep better in a cool environment. How old is your mattress – maybe it’s time to replace it? Do you have black out blinds or curtains, noise reductions strategies like good quality ear plugs and eye masks may be worth investing in. It’s best not to eat too close to bed time. There are some foods that are considered helpful for sleep you can explore these and perhaps having a milky drink. There is also evidence that Cherry Juice is helpful! Writing down your to do list before sleeping is a really helpful practice to stop the worrying mind. You can be reassured you won’t forget as you have written it down. Another really helpful pre-sleep activity is the practice of gratitude. You can also write down at least five things you are grateful for at the end of the day. If you don’t want to write it down you can call to mind five things that you are grateful for. This is a really powerful practice that will incline your mind towards happiness and enable you have a more peaceful sleep. Mindfulness – of course! At the lecture on Monday I lead the attendees in a short mindfulness practice – if it had of been any longer they may have fallen asleep! First I asked them to place a hand over the heart in the gesture of self-compassion. The brain perceives this practice as soothing and comforting. I then asked them to place a hand on their belly. This practice is helpful to encourage the breath to go deeper. I then asked them to focus on their in-breath. As they consider the in-breath I asked them to realise how with each in-breath the body is being nourished. With each in-breath new fresh oxygen is coming into the body to nourish and replenish every cell in the body. After a while of focusing on the in-breath I asked them to begin to focus on the out-breath. To begin to notice that with each out breath their body is soothed and comforted. The exhale is soothing. Then I asked them to focus on both the inhale and the exhale at the same time saying the word ‘nourishing’ with the in-hale and the word ‘soothing’ with the exhale. Nourishing and Soothing. Nourishing and soothing over and over. Focusing on the breath like this will activate the parasympathetic nervous system (the rest and digest system) it will lower the blood pressure and heart rate and activate soothing hormones in the body. Soon you will fall asleep and if you don’t you will be able to accept it without adding more worry on top.